Be bold, be confident. 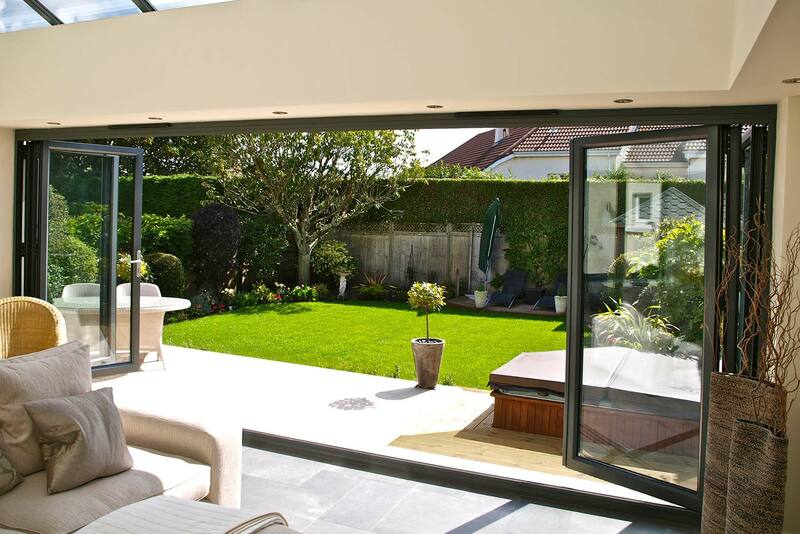 Be the proud owner of Bi-Folding doors from Camberley Glass. We have been providing window and door solutions in for over forty-five years, our experience in glass glazing and door replacement solutions is second to none. Have you ever dreamed about turning your outside space into another room? Bi-Folding Doors can create beautiful panoramic views and imbue a relaxed living environment into your homestead. With the latest technology, the flexibility of Bi-Folding Doors make it an ideal solution for kitchen extensions, allowing a seamless transition from inside to outside. The focal point of the Bi-Folding Door is the concertina fold – a feature that allows the doors to be stacked, separates Bi-Folding Doors from traditional sliding doors and French doors. This creates a slimmer profile whilst simultaneously maximising all available space and natural light. So, what makes Bi-Folding Doors so unique? They’re readily adaptable and can provide an ideal solution not just for kitchen extensions but also walk-in-wardrobes, utility rooms and much more. The Camberley range of Bi-Folding Doors is extensive, we are able to offer UPVC and Aluminium frames with a huge variety of colours and textures. Different materials, but with the same guarantees; aesthetically pleasing, energy efficient, high quality, low maintenance and a high level of security. Our expert team with a combined 200 years of experience, are fully qualified and FENSA registered and are waiting to provide you a-start-to-finish design and build service with a dedicated project manager. We pride ourselves on our high standards of customer service, reliability and workmanship which is why 75% of new business is from personal recommendations. We also offer a 24-hour emergency service, 365 days of the year to both domestic and commercial clients, with a response time of under an hour. All of our work comes with a guarantee insured by HomePro Insurance. Satisfied customers include British Airways, Barratt Homes and Windsor Castle.